North West England is one of the regions of England in the United Kingdom. 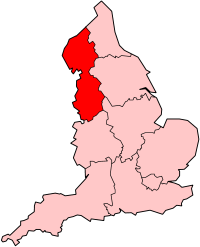 The cities of Liverpool and Manchester are in the south of this region. The northern area (which includes Cumbria and part of Lancashire) is full of villages. This page was last changed on 9 August 2014, at 21:41.